Not sure how to cook Cedar Plank Pork Loin yet? No problem! 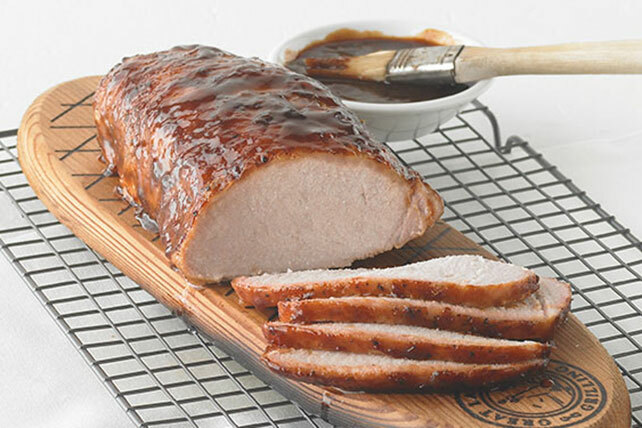 Learn how to prepare Cedar Plank Pork Loin with these handy step-by-step instructions. Immerse plank in water, placing a weight on top of plank to keep it submerged. Soak 4 hours. Heat grill to medium heat. Mix barbecue sauce, teriyaki sauce and orange zest until blended. Reserve half the barbecue sauce mixture for serving with the cooked meat. Brush top of plank with oil; top with meat. Place on grate of grill; cover with lid. Grill 1 hour or until meat is done (145°F), turning and brushing with remaining barbecue sauce mixture for the last 20 min. Remove meat from grill; cover loosely with foil. Let stand 3 min. Transfer meat to cutting board. Discard plank. Cut meat into thin slices. Serve with reserved barbecue sauce mixture. Place sliced meat on platter. Garnish with navel orange slices or wedges before serving. UNTREATED cedar planks, which are sold for this purpose, can be found at most specialty food stores or some grocery or hardware stores. During cooking, check periodically to make sure that the plank is not on fire. Since the plank can ignite when exposed to flames, it is best to keep a spray bottle of water close at hand if needed to extinguish any flames. The plank can be soaked up to 24 hours before using as directed.